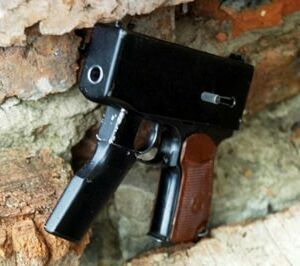 The "PROTOTYPE 1130" looks like a full-auto conversion of the Makarov pistol, engineered by ALEKSEJ KONOVALOV, from RAMA (Russian Academy for Missiles and Artillery) Following information from: http://club.guns.ru/eng/konovalov.html --- THE NEW PRINCIPLES OF BUILDING A ROTARY BOLT: UNUSUAL FULLY-AUTOMATIC CONFIGURATION OF THE "MAKAROV" PISTOL (article by Aleksej Konovalov) "The rotary (sliding) bolt has become popular in the calibers of automatic small arms as, in addition to its main function of locking the barrel bore during the shot, the bolt performs a number of other functions: - accumulator of energy required for performance of automatics; - it accommodates extractor; - it performs as a ramming device; - it holds the next round in the magazine. Some of these functions can be carried out by the bolt carrier as well. In order to accumulate enough energy during a shot, with the limitation of velocity of collision of moving components at hand, the bolt (bolt carrier) should be heavy. In order to avoid increasing the width of a gun, the bolt should be long enough. If we could limit the width of the bolt to the function of holding the next round in a magazine, its section specified as "À", shall be unnecessary (Fig. 1a). The bolt needs the amount of travel "À", which serves, on the one hand, to synchronize in time the motion of the bolt and the feeding the cartridge into the line of ramming. On the other hand, "À" is required to adjust the rate of fire. The second factor is predominant in most of the cases. As a result, the receiver [automatic housing] tends to acquire excessive dimensions, and makes the entire weapon's system rather extended in terms of longitudinal sizes. The PPSh - the system taken as classic - has a 270-mm long barrel. The internal size of the receiver that houses automatics is 350 mm long. Thus, the excessive length of the bolt equals 120 mm, while its excessive travel (amount of travel of bolt's face behind the cartridge's head) is 60 mm. By eliminating bolt's excessive length and travel, the receiver could have been reduced by 180 mm. 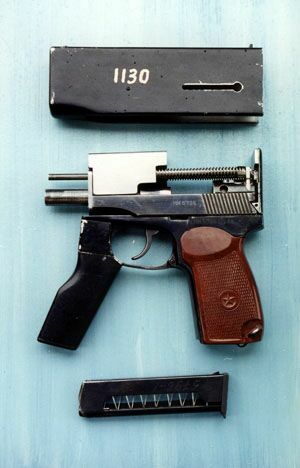 The method of reducing the amount of bolt's length is materialized in the UZI submachine gun by locating the "l" portion of the bolt above the barrel (Fig. 1b). Such a scheme has become common in such weapon systems as Ingram and Steyr. By reducing the amount of bolt's travel over the cartridge head to the level required for synchronization with feeding, we increase the rate of fire. This is exactly why most of the modern submachine guns feature the rate of fire upto 1,200 rpm. It should be noted, however, that the spread of hits in a burst is optimal if the rate of fire is around 450 rpm. In the following scheme (Fig. 1 c) the travel of bolt over the head of the cartridge (overrun) can be eliminated at all. Bolt 1 (bolt carrier) consists of the two parts that are firmly put together by means of a one-way link. The reverse direction of the link is spring-loaded (Application # 96112400 (018160), author: A. Konovalov. Bulletin of Invention # 25 of September 10, 1998). When the shot is delivered, the case (piston rod of the engine) transfers pressure onto the bolt (slide). The two components, due to the rigid linkage, are moving as a single piece. As soon as the bolt covers the amount of travel sufficient for stripping the next round, the slide is stopped and retained in this position by spring 3. Further motion is performed only by the inertia body of bolt 2 (inertia mass). Reaching the point of impact at the rear side of receiver, the inertia body returns into its initial position by means of spring 4. On its way back, the bolt follows inertia body 2. Here, the amount of travel performed by the inertia body is significantly greater that the amount of travel performed by the bolt in the two previous cases. This phenomenon reduces the rate of fire. Furthermore, separation of the bolt recoil impact into two cycles reduces its effect on the shooter, which helps reduce the spread of hits. The above scheme makes it possible to reduce overall length of receiver to the size of two lengths of the cartridge. Further reduction of the size of receiver is also possible, provided the bolt is free of the function of holding the round in the magazine. This, however, hardly deems practical as the construction may become too complicated. 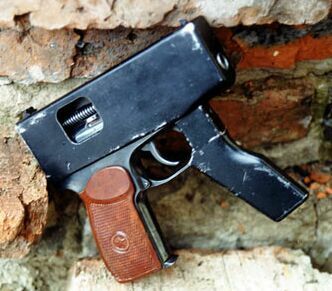 For the purpose of proving the above statements, an experimental prototype of a submachine gun was devised, based on the Makarov PM pistol. Its overall length and width remained intact, while the height is 20 mm greater. The overall (empty) weight of the weapon is 1,020 g. The weight of moving parts is approximately 400 g. Despite such miniature dimensions, the weapon features the rate of fire of 950 rpm - the factor proves functionality of the elaborated scheme. Considering that the submachine gun chambered for the PMM (9x18 mm) or Parabellum (9x19 mm) cartridges should have barrels from 150 to 160 mm long, we can build an automatic weapon 220 to 230 mm long, featuring the rate of 600 to 700 rpm. In such a weapon, we can use an additional folding (front) grip or a buttstock similar to the Mauser or Stechkin pistols.